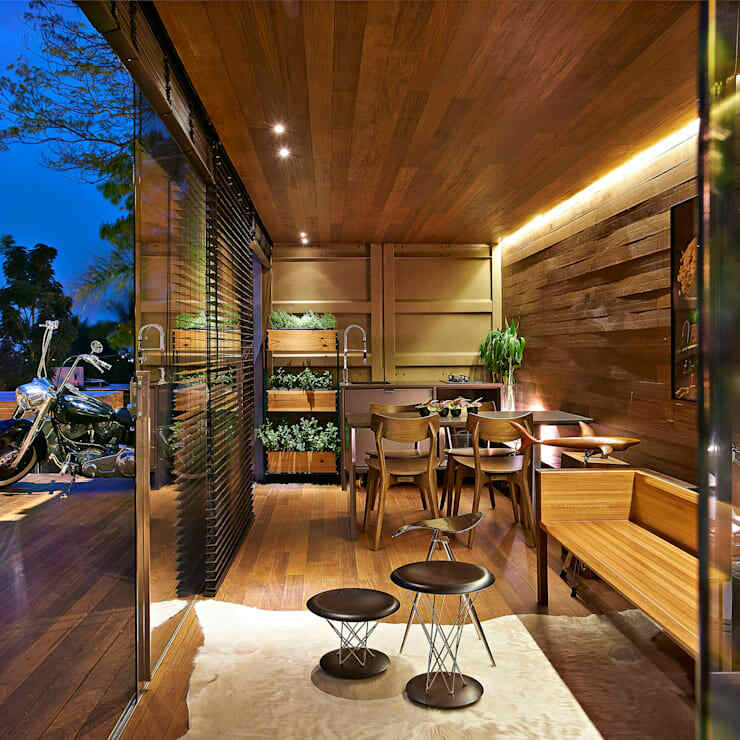 Container homes are often thought to be cramped, gloomy and lacking in style or personality. But this Pocket House, designed by the Brazilian architects at Cristina Menezes Arquitetura, will force you to change your views! 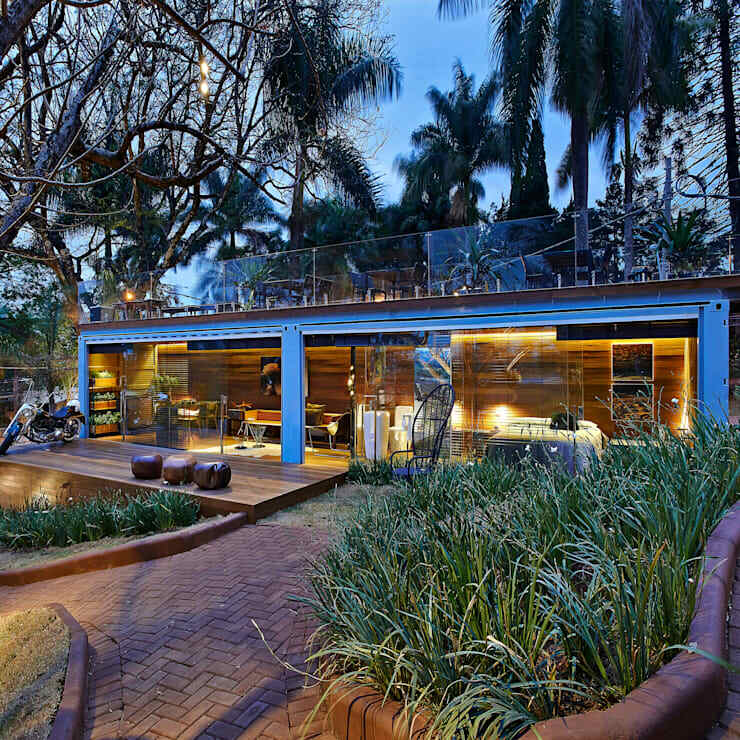 Situated amidst lush vegetation, this sleek and trendy residence makes lavish use of glass and natural wood for a warm, rustic and trendy appeal. 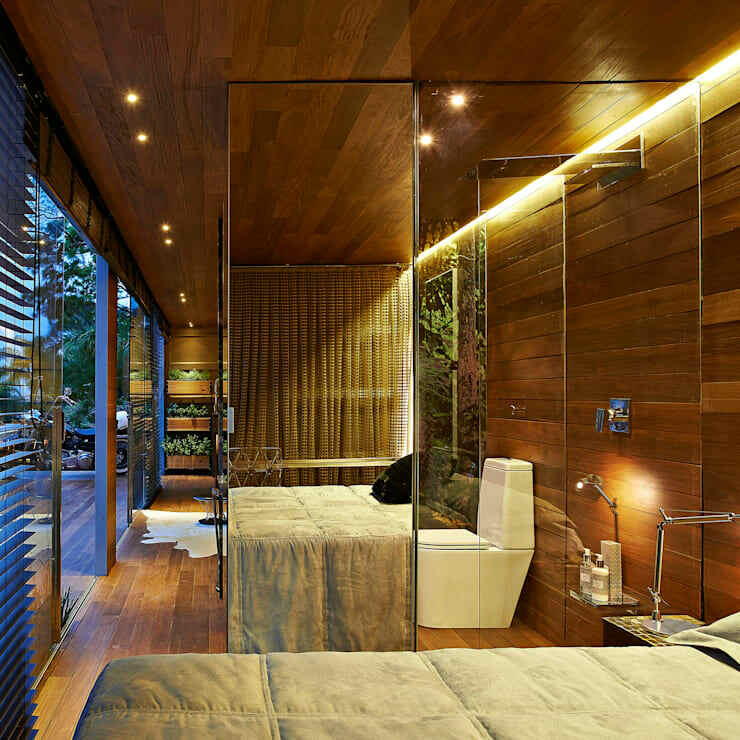 Glass walls ensure a feeling of openness for the home, besides allowing sunlight to flood the interiors. And wood makes the structure eco-friendly and sustainable. The layout of the inside is linear, simple and practical, with glass offering visual continuity. Soothing light, indoor greens and cosy textures add pizzazz to this smartly planned abode. Keen to see more? Join us as we look around! Clear glass walls lend copious style and sophistication to the linear facade, while verdant bushes and towering trees surround the house magically. A wooden deck with quirky seats lets you enjoy open-air pleasures—though you can soak in nature’s beauty from the inside as well. The expansive and airy rooftop terrace comes with clear glass balustrades and is ideal for entertaining friends in the middle of greenery. 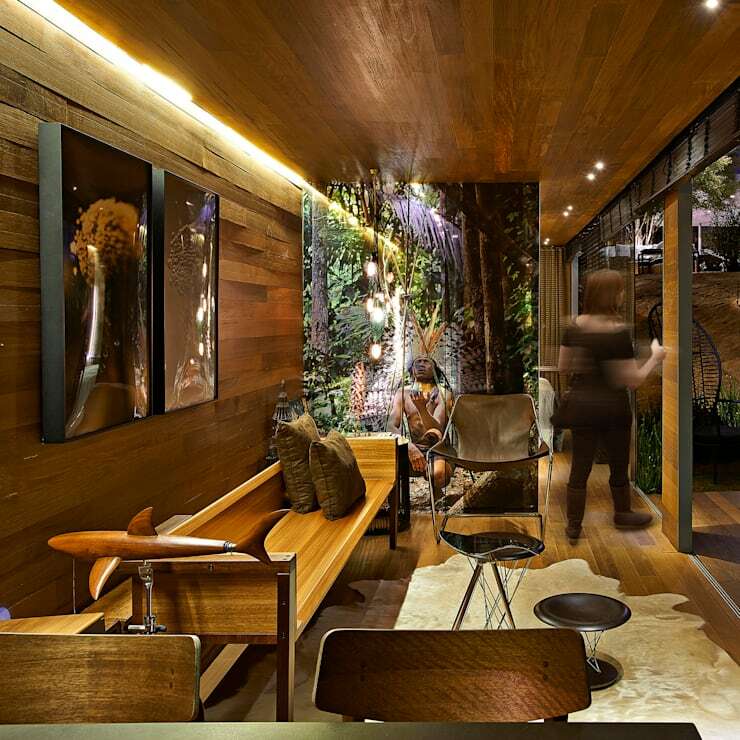 Generous use of wood for the wall, floor and ceiling make this compact home a warm and cosy place for singles or young couples. The stylish furniture makes use of wood and neutral, earthy tones to match the environment. A faux animal skin rug, quirky coffee tables and some exotic artworks lend personality to this living space. The living area merges seamlessly with the cute and compact kitchen and elegant wooden dining arrangement. Softly glowing ambient and recessed lights fill the home with a soothing vibe, while vertically stacked planters bring natural freshness inside. At the other end of the linear abode, we find the cosy and softly illuminated bedroom. Plush bedding promises hours of comfort, while a sleek desk near the window acts as a home office. Sleek glass panels integrate the space with the bathroom, while the closet comes with a mirrored door to lend the illusion of spaciousness. 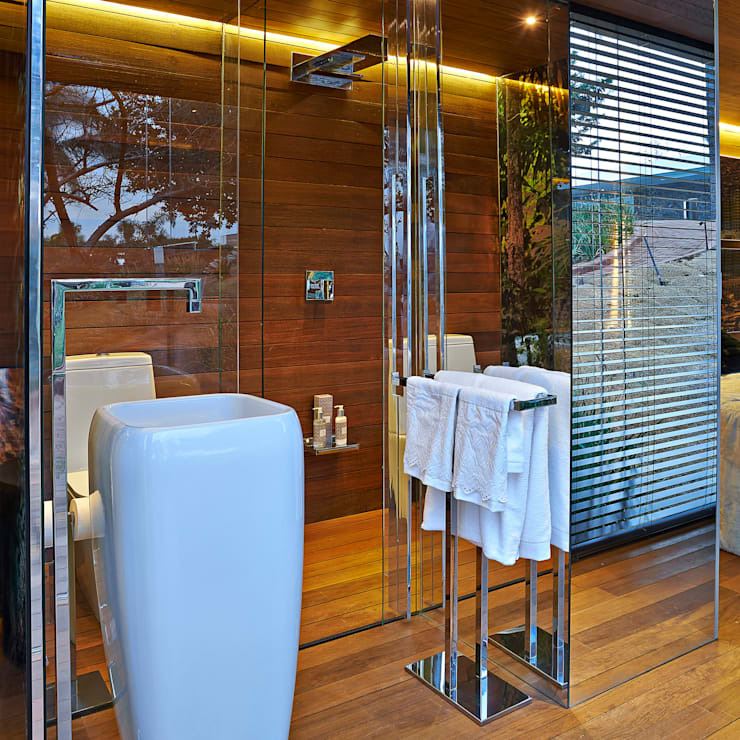 Smart use of glass panels opens up this compact bathroom visually, while wood adds warmth and homeliness to the space. The fashionable WC and shower can be accessed from both the bedroom as well as from the common passage. Stylish blinds offer privacy here, while a tall and unique washbasin stands outside to avoid cluttering the bathroom. What a simple, convenient yet delightful container home this is! It totally redefines urban living with classy and environment-friendly touches. Check out another tour for more ideas: A 130m² family home (plans included) for under S$90k. Which room of this amazing little home is your favourite?